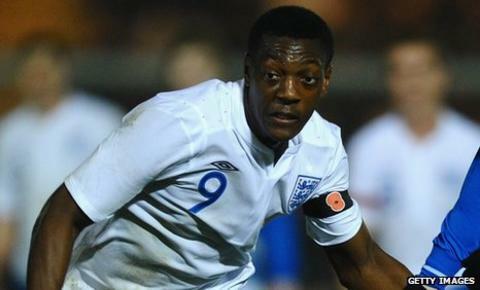 England Under-21s maintained their 100% start to the 2013 European Championship qualifiers by cruising to a 5-0 victory over Iceland in Colchester. Marvin Sordell smashed in the opener from Jordan Henderson's pull-back and Martin Kelly fired in a second. Craig Dawson's late header made it 3-0 and there was still time for Gary Gardner to curl in a 20-yard free-kick and drill in a low shot. England are five points clear in Group Eight after four straight victories. Manager Stuart Pearce will now take his squad to Belgium for their next qualifier on Monday in buoyant mood. He said: "There were one or two fresh faces who came into the squad and they have done themselves no harm. "They are all just waiting for game-time now, whether it is at their clubs, in the reserves, on loan, or with us at the Under-21s. "I was disappointed at half-time, when I thought we were playing within ourselves a bit, but we were a lot better in the second half, and although it was a fantastic result, the final score flattered us a bit, but we did have a lot of chances." Before kick-off, there was a minute's silence ahead of Remembrance Day. England, sporting poppies on their black armbands, started brightly as Sordell forced a good save from Iceland goalkeeper Arnar Petursson and Alex Oxlade-Chamberlain shot wide. Pearce's team broke through five minutes before half-time when Jordan Henderson broke into the right side of the penalty area and pulled the ball back for Sordell to smash in the opener. The hosts continued to press and Kelly finished coolly into the far corner to make it 2-0 just before the hour mark. Oxlade-Chamberlain was twice denied by Petursson, before Dawson looped in a header with five minutes remaining. Aston Villa's Gardner, on as a substitute, then curled a superb free-kick over the wall and into the top corner before drilling home his second goal after good work from Oxlade-Chamberlain. England: Butland; Smith, Kelly, Dawson, Clyne; Lowe (Gardner 62), Henderson, McEachran (Keane 78); Oxlade-Chamberlain, Sordell, Delfouneso (Ameobi 11). Subs not used: Amos, Dunk, Butterfield, Carroll. Iceland: Petursson; Jonsson, Eyjolfsson, Laxdal, Snorrason; Sigurbjornsson (Hiynur Magnusson 76), Gudmundsson, Margeirsson (Thorarinsson 71), Sverrisson (Bodvarsson 53); Johannsson, Palsson. Subs not used: Asgeir Thor Magnusson, Sigurjonsson, Valdimarsson, Steindorsson.